NO.1 Solution - Wanna rip Blu-ray to H.264 MKV for HD Playback? Summary: Still have doubt about how to rip Blu-ray to H.264 MKV for playing? This article shares a step-by-step guide on how to convert Blu-ray to H.264 MKV so that you can enjoy your Blu-ray movies more conveniently. As cloud storage becomes more affordable, physical storage media Blu-rays are quickly becoming a thing of the past. If you get a Blu-ray movie, you may want to play them on your different media players or portable devices like the new iPad Pro, iPhone 6S, or HDTV. Although Blu-ray file is convenient for backing up and archiving, but it’s not natively supported by most digital players. Why not rip and convert your Blu-rays to store as H.264 MKV files for playback on your devices? And so they are accessible across different media formats you own. To rip Blu-ray for HD backup and then to play on HDTV or other HD media players, convert Blu-ray to H.264 MKV will be your best choice. In that case, a decent Blu-ray ripper plays a big role. Here, Pavtube BDMagic is one of the most frequently used Blu-ray ripping tool to convert Blu-ray movies to H.264 MKV as well as H.264 MOV, H.264 MP4 etc videos in an amazing way. Read the review. With full Blu-ray supports, it is capable of removing AACS and BD+ copy-protections as well as converting Blu-ray to all other regular video formats like MP4, AVI, WMV, MOV, FLV, WMV, etc. Moreover, video editing functions like clip, rotate, add watermarks, adjust video effects, etc. are provided. You can get H.264 encoded HD MKV from Blu-ray not only for space-saving storage but also for playing on H.264 compatible multimedia players like VLC, Divx, PotPlayer, PowerDVD 14 Ultra, etc with rich media experience. For Mac users, you can turn to Pavtube BDMagic for Mac(including El Capitan). Now just choose the right version according to your demand and follow the guide to accomplish the conversion. Install and launch the best Blu-ray to H.264 MKV Converter program. Insert your Blu-ray disc into your BD drive, and click "Load file(s)" icon to load your Blu-ray movies. You can also import movies files from Blu-ray folder, ISO and DVD discs. 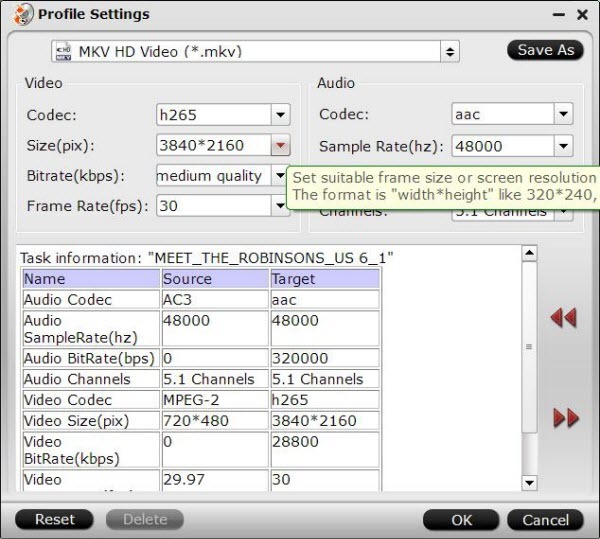 Step 2: Select H.264 encoded HD MKV format to output. Tap on the "Format" bar to select "HD Video" > "MKV HD Video(*.mp4)" to output, then hit "Settings" on the main interface to open "Profile Settings" window, under Video settings panel, click "Codec" drop-down selection, choose "H.264" as your final output file codec. If you want to play converted Blu-ray movies on 4K TV, you can upscale the output file resolution to 3840*2160 from "Size(pix)" in the "Profile Settings" window. Step 4: Convert Blu-ray to H.264 encoded HD MKV format. Hit the "Convert" icon on the right-bottom to start the conversion process. Get ripped Blu-ray files by clicking the "Open output folder" button. Then you will be able to save all your precious Blu-ray movies with subtitle languages and audio tracks well reserved for playing on various H.264 capable players with rich media experience. How to Watch Blu-ray on 50" Plasma TV via Plex Server?